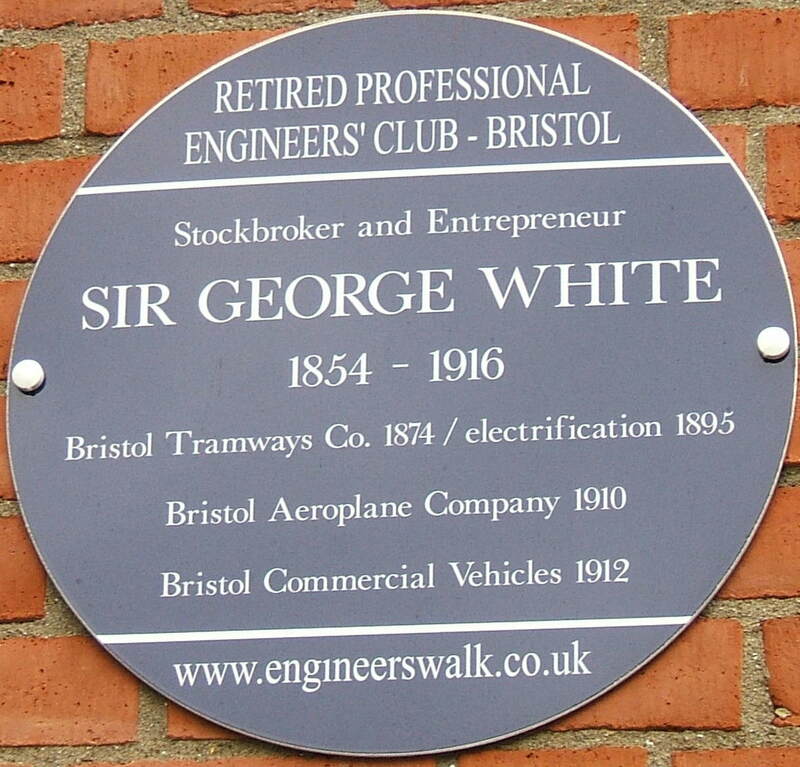 On 22nd October 2014 at @Bristol, John Coneybeare (President of Retired Professional Engineers Club)organised a small ceremony to unveil a plaque on the @Bristol aquarium building, celebrating the life and work of Sir George White. Guests attending included the great grandson of Sir George White (of the same name) and Lady White, Mr James Imtey - Head of communication for Airbus in the UK, Vivien Lebbon - Communications Assistant Staff photographer. The plaque was kindly sponsored by Airbus. 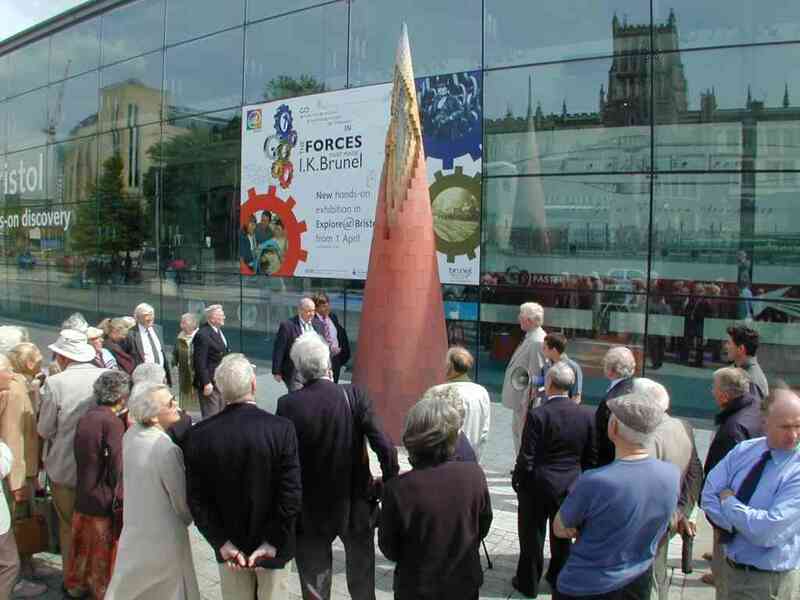 The unveiling was accompanied by a short tour and talk on the history of the Bristol harbourside by John Coneybeare, visiting Pierrot's Bridge, some of the other plaques and the Paul Dirac monument.The event was concluded with tea and cakes in the @Bristol cafe. 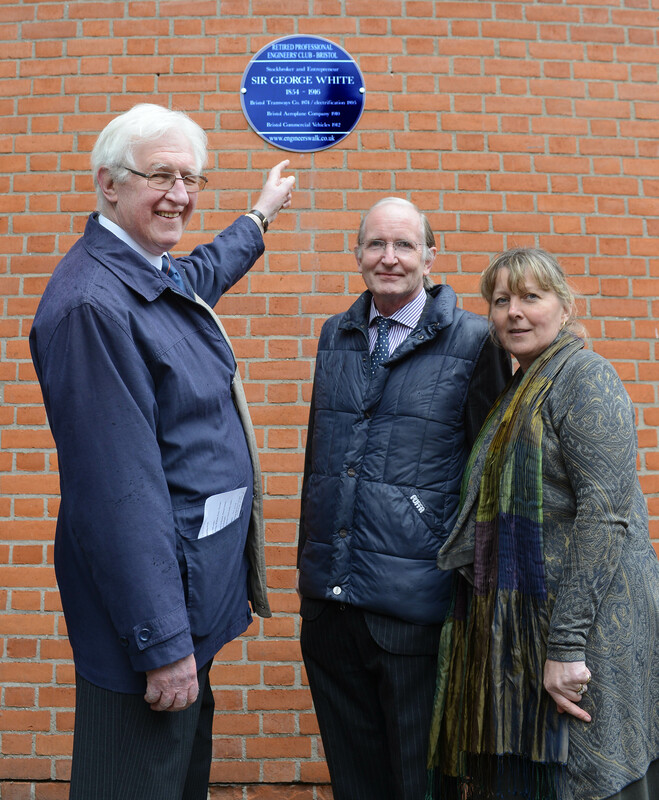 Supported by @Bristol, Engineers' Walk was inaugurated with two	commemorative plaques along the trail that honours William Patterson, and Sir Archibald Russell and a pause to honour Paul Dirac. 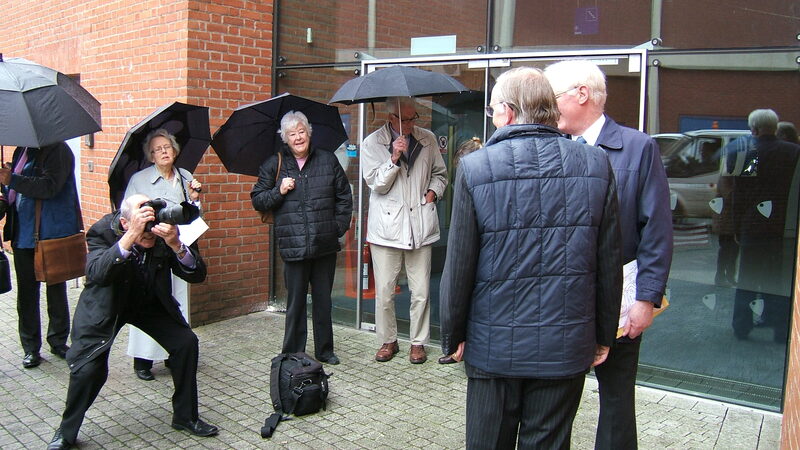 The inauguration day of Engineers' Walk was attended by Ms. Julia Elton of Clevedon Court, the well-known champion of engineers and engineering, Mr. Goery Delacote, Chief Executive of At-Bristol, Mr Julian Russell, the son of Sir Archibald, and the great-great-great-granddaughter of William Patterson Mrs. Michelle Miles. You are looking at the southern half of the trench that was	completed in 1247. The northern half is behind you and covered. The trench is 800m	long, 40m wide and 6m deep. The River Frome was diverted through the trench and made Bristol an international port. This was the commercial heart of the city for over 700 years, finally closing to commercial shipping in 1977. 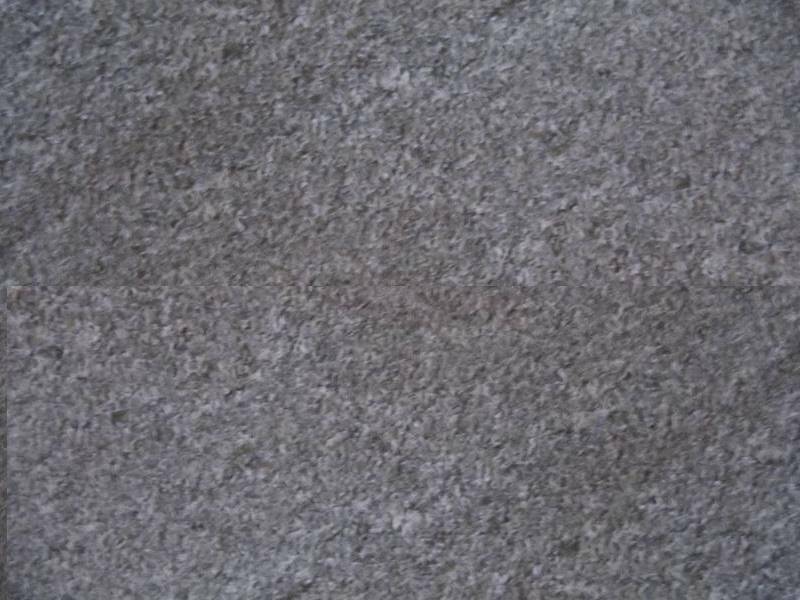 The Frome/Avon river system is tidal with an exceedingly high range. At low tide ships could not navigate and sat on the river bottom. They had to be 'ship shape and Bristol fashion' to survive this treatment. 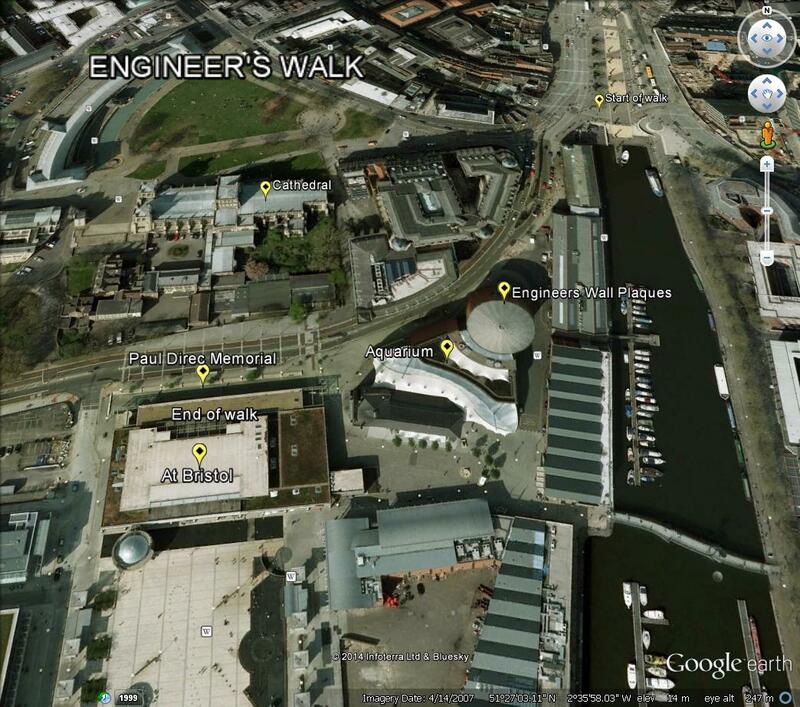 It was the civil engineer William Jessop (1745 - 1840) who made the City Docks into a 'Floating' Harbour. The River Avon was diverted	into a new course (The New Cut) over 3 km long. The old course was dammed up with access by large locks. The works were completed in 1809. William Patterson was born in poverty in Arbroath, Scotland in 1795. At the age of 15 he was apprenticed to a London shipbuilder learning to build wooden sailing ships but also installing early steam engines. In 1823 he moved to Bristol and 8 years later took possession of his own	shipyard. His clipper style Velox (1834) was much admired. It was natural that he was selected by his friend Brunel to build the Great Western (1838), the first transatlantic liner. Patterson drew the hull for Brunel's next ship	the Great Britain (1843) and also built it. The largest ship in the world and built of iron, with screw propulsion - she was the mother of all modern ships. The Demerara (1851) was damaged on her maiden voyage but was rebuilt by Patterson as	the world's largest sailing ship. Patterson became a member of The Institute of Naval Architects when it was founded in 1860. He retired to Liverpool in 1865 and died there	in 1869. Patterson's first shipyard was at Wapping on the site of the Bristol Industrial Museum. The Great Britain can be visited in the very shipyard where she was built. Archibald Russell was	born in 1904 and raised in the Forest of Dean. 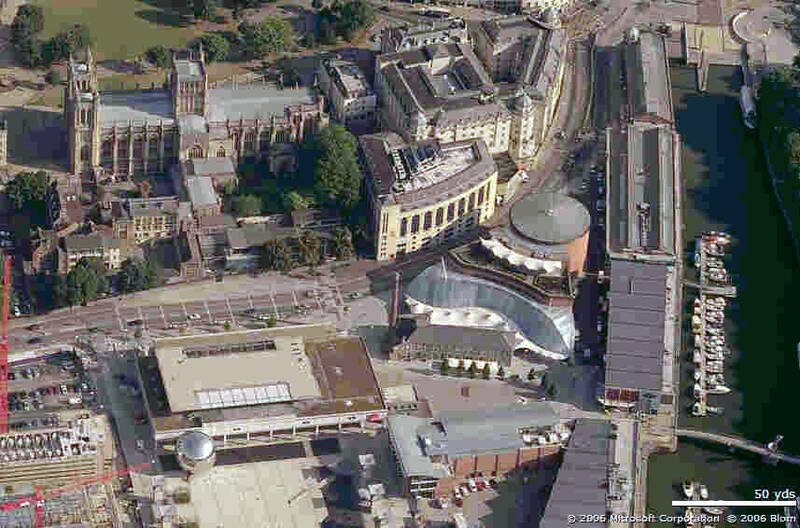 His family moved to Bristol when he was 15 and was awarded a BSc degree in Engineering at the University of Bristol. He joined the Bristol Aeroplane Company in 1925 as an assistant stress calculator when they were still making Bristol Fighter biplanes. He became the company's expert in wing design and was involved in the design of the Second World War Blenheim and Beaufort bombers and the Beaufighter. As Chief Engineer, he was responsible for the Freighter (1944), Brabazon (1949) and	Britannia (1951). In 1959 he designed the Bristol Type 223 supersonic airliner. This aircraft was built by a consortium of French and British companies and named	Concorde. Shortly after the maiden flight of Concorde in 1969, Russell retired as Chairman, Filton Division, British Aircraft Corporation. He was knighted in 1971 and died in 1995. Archibald Russell lived in Westbury and worked in Filton. Paul Dirac was born in Bristol in 1902. 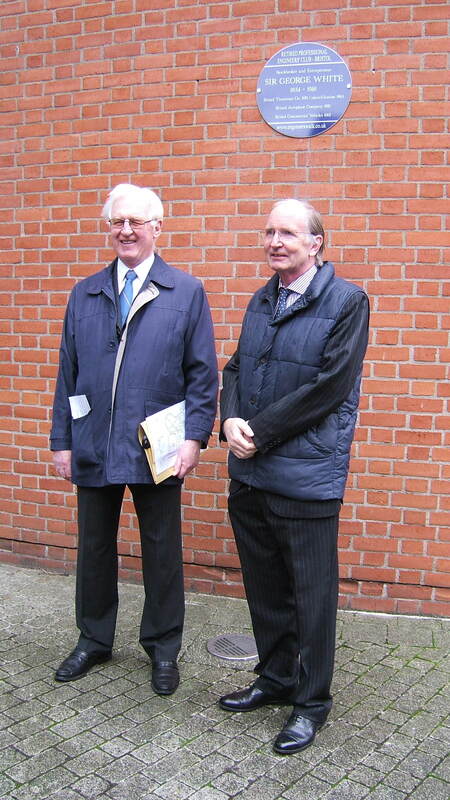 He first trained as an Electrical Engineer at the Merchant Venturers' Technical College, but went on to study	Mathematics and Physics at Cambridge. He was one of the founders of both quantum mechanics and quantum ectrodynamics. In 1928 Dirac took an important step towards bringing quantum physics into conformity with	Einstein's special theory of relativity by devising the equation that bears his	name. In 1931 Dirac predicted the existence of a sub atomic particle with the same mass as an electron but with a positive charge (positrons). So, Dirac was recognised as the 'discoverer ' of antimatter - one of the most important discoveries of the 20th	century. From 1932 - 1969 Dirac held the Lucasian chair of Mathematics at Cambridge, the post	that Isaac Newton had once held. Dirac retired to the USA where he became Professor of Physics at Florida State University and died in 1984. The Retired Professional Engineers Club (Bristol) is grateful to the management of At-Bristol and Bristol Aquarium for their kind permission to attach commemorative plaques to the walls of their buildings.